Maintaining your healthy teeth and mouth is a matter of good daily habits. If you are tempted to skip parts of your daily dental care, remember that good dental practices are not only good for your health, they also help your appearance and improve your quality of life. James River Family Dentistry follows the American Dental Association’s recommendations to brush and floss daily. You have been brushing so long you probably don’t even think about it. But you may have fallen into some careless habits. Let’s review the basics, starting with the two by two rule. This rule says you should brush at least twice daily for two minutes each time. It may seem like a minor detail, but if you spend less time, you may be missing spots. Think about what you are doing. 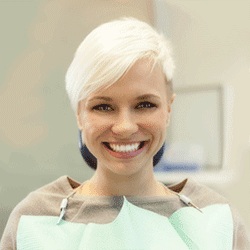 Are you paying attention to all of the surfaces of your teeth? Use a soft-bristled brush that fits your mouth so that you can reach all areas comfortably. Replace your toothbrush at least every three or four months. Some experts recommend using a rechargeable power toothbrush. Why? It essentially does the job of brushing for you. Also, many dentists believe it removes more plaque. Brush with a fluoride toothpaste that has the American Dental Association Seal of Acceptance. Floss every day, not just occasionally. It is an essential part of your daily dental care. Remember, when you brush, you are only cleaning two sides of your teeth. Flossing also cleans the sides of your teeth, reaching those tight spaces between the teeth as well as between the base of the teeth and the gums. According to the American Dental Association, flossing before brushing removes stubborn food particles and plaque. It also keeps your gums healthy. You may also want to use a mouth rinse, to fight plaque, tartar, gingivitis and tooth decay. There are different types of therapeutic mouth rinses, available both over-the-counter and by prescription. Your dentist can advise you about the right type of mouthwash for you. When we are eating and drinking, we usually don’t think much about our teeth. It should be no surprise that sugar is bad for your teeth, so you need to know what foods and drinks contain lots of sugar. Naturally, candy contains plenty of sugar. Sour candy also has certain acids that are bad for your teeth. Also, they are chewy, so they stick to your teeth and are more likely to cause decay. Bread is another culprit. When you eat bread, your saliva turns the starches into sugar and makes a gummy paste that sticks to the crevices between your teeth, leading to cavities. Carbonated soft drinks not only contain large amounts of sugar, but they also contain citric and phosphoric acids, which eat away your tooth enamel. If you choose to have a sugary drink, drink water afterward. Drinking alcohol can dry out your mouth. We need saliva because it washes away sticky food particles. Certain medicines also contribute to dry mouth. To keep your mouth well hydrated, drink enough water. Your dentist may also recommend fluoride rinses or oral hydration solutions. Everyone urges you to brush your teeth, but it is possible to brush too hard. Brushing with too much force, or using a hard toothbrush, can damage teeth and irritate your gums. Think of it less like scrubbing and more like gentle rubbing. Grinding and clenching may be caused by stress or anxiety, but it may also be caused by an abnormal bite or crooked teeth. It often occurs during sleep, which makes it hard to stop. This habit can, however, cause your teeth to chip or crack. It also causes joint pain or tenderness. Many people bite their nails as a nervous habit, but it can chip your teeth. It also may place your jaw in a protruding position and lead to jaw dysfunction. You may love eating ice with a flavored syrup, or maybe just eating plain ice is your guilty pleasure. The fact is that chewing on ice may cause cracked and chipped teeth, or problems with dental work, such as crowns or fillings. It may also cause your teeth to become sensitive to hot and cold foods or drinks. Constant snacking throughout the day makes you more vulnerable to tooth decay, cavities, and gum disease. Your teeth were designed for eating. They were not meant to rip open packages, bite through hard plastic, or hold heavy objects. When you use your teeth as tools, there is a risk of cracked teeth or jaw damage. Following these daily do’s and don’ts will help you maintain a beautiful healthy smile for life! If you’re in need of dental care or it’s time for your routine appointment, contact James River Family Dentistry at 804-323-4200. We are happy to see you!